It is a rare three-part single that sounds like no other: each time you listen to it, you will hear a new riff or sound that you missed previously! This track offers distinct and memorable dynamics and simple lyrics that appeal to a broad international audience and entertain dance music fans who speak any language. We Are the Universe brings to you unexpected, juicy overtones of hard house, hard trance and psy trance. To be enjoyed by EDM lovers everywhere, this wonderful release from TuneDome Records belongs in your collection. 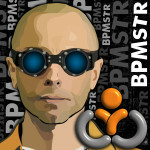 Watch for at least 8 more releases by BPMstr from TuneDome before the end of this year.